Voluntourism is an awkward word but what it means is incredible. It adds the idea of volunteering to the concept of tourism. It’s a great way to add some substance to your travels. Beyond just visiting and seeing a place foreign to you, you now have a chance to get your hands dirty and contribute to a community and a people less fortunate than you. This is a rewarding and authentic way to see the world. I was privileged to join a number of American teens this summer as they traveled to Peru to build a classroom. 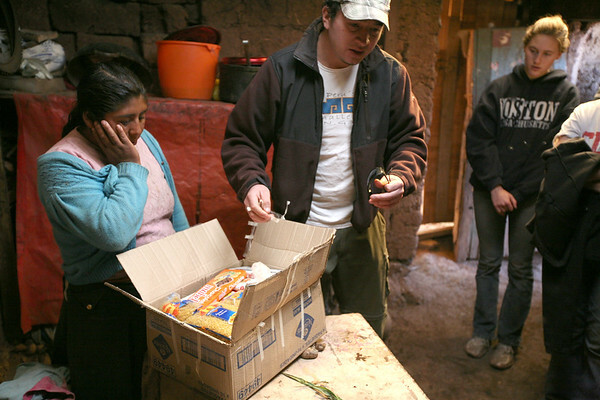 There are many voluntourism companies around the world and the one we were working with is called Peru’s Challenge. In 2002 founders Jane and Selvy started a program to work with rural Peruvian communities to help them build a sustainable infrastructure. 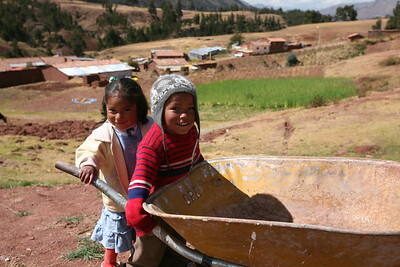 Peru’s Challenge works with the community to establish a 3-5 year plan to address education and utilities. In our case, we were helping with the education side of things by building a classroom in the small village of Miskiuno near Cusco. In other instances, Peru’s Challenge builds greenhouses, aqueducts, sewage systems and more. They also provide social services to help the community apply for government assistance, train teachers for the school, teach community members how they can use the greenhouses to grow and sell food and flowers as well as weaving and other textile skills to take products to market. But it’s not all hard work in supporting these communities. The tourism aspect of the plan is not forgotten. 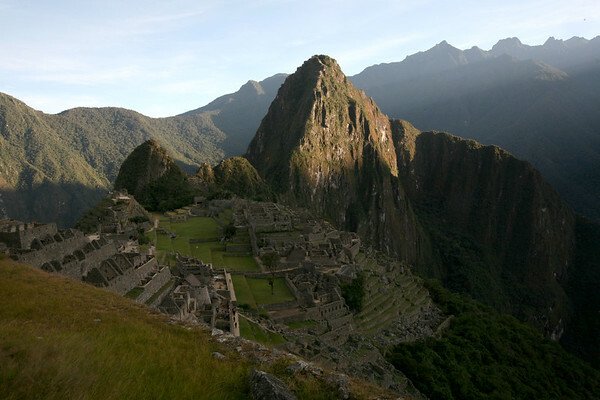 Peru’s Challenge sets up an itinerary to work during the week and to travel on the weekends. 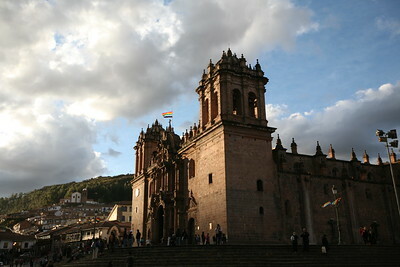 We arrived on a Friday and spent the weekend touring Cusco. We visited open air and covered markets where vendors were selling everything from arts and crafts to household wares to flowers and groceries. We strode through the Plaza de Armas in the long beams of evening sunlight and toured museums to learn of the history of the Incas and Spanish. We awed at the laser precise Incan stone cutting and how they fit together so perfectly you couldn’t even fit a sharp needle into the seams of the walls. And on that first weekend, we attended Inti Raymi, the annual Festival of the Sun, at the Incan ruins known as Sacsayhuamán. We crammed ourselves on a grassy hillside amongst the locals above the arena area to wait for hours to (barely) see a series of reenactments describing the mythical history and origin of the Incan people as well as various ceremonies to honor the Incan god Inti in hopes for good crops, good weather and a peaceful existence. On Monday we traveled to our construction site where a concrete foundation perimeter had already been set and the adobe mud bricks were stacked in piles ready to be transformed into a classroom. More mud was made (referred to on the job site as ‘barrow’) right from the adjacent hillside to be used as the mortar to stick the adobe bricks together. The teens jumped into the work with admirable gusto and in five short days a 20′ x 10′ classroom was added on to the existing classroom nearly doubling the size of the Miskiuno school house. 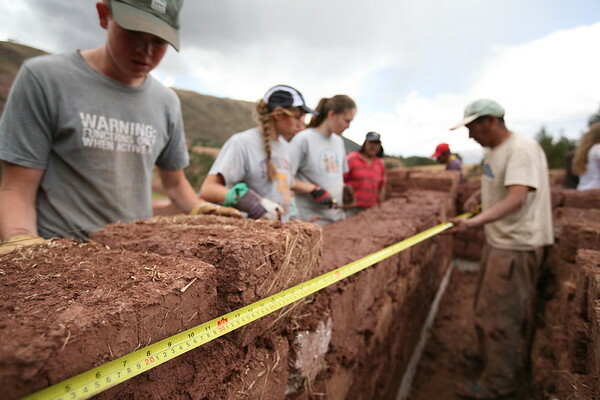 While the classroom was being built, a team of about five teens would take turns to teach at the larger nearby school (which was also a Peru’s Challenge project) in the town of Pumamarca. The teens prepared lesson plans to teach English, Music, Dance and Sports to the excited 2nd to 5th graders. Resourcing does not get any more local than this. The mud and straw to make the adobe bricks along with the eucalyptus trees for the roof trusses came from right there. While the bricks were made ahead of time so they had a chance to dry and could be used, the trees were hewn in the days of construction and the teens were part of the process to strip the bark and cut and chip the trees to size using a custom form staked out in the ground. One aspect that made a big impression on the teens was how grateful the community was before they even started construction. There was a small welcoming and gratitude ceremony on Monday when they all arrived. Then once they finished on Friday after nailing the last of the roof to the trusses another celebration was thrown as all the members of the community gathered for the dedication of the new classroom. The teens were thanked with handfuls of wild flowers, hand made cards by the local children and hugs all around. Many of the teens, adults and community members were moved to tears by this joyous occasion and gift given to them to help educate their children to make a better life for themselves. The teens were also treated to a home visit. This was where one of the community members welcomed small groups of teens into their homes and shared their humble living conditions. Mud floors, chimney-less cooking fires, rickety benches and tables were the standard for the visits made. As part of a thanks for letting us see their homes, Selvy brought along a care package full of food and supplies that brought a long string of gratitude from our hostesses. The stories they told of their conditions were heartbreaking. An alcoholic husband who had left the family or even passed on leaving the mother and her 3-5 children on their own. Stories were also told of cancer eating away at the family causing the need to go to Lima (the expense covered by Peru’s Challenge) for treatment. The home visits hit some of the teens pretty hard as they heard and saw the meager conditions these people live in. When the teens would meet to debrief the day they could hardly believe what they saw and experienced and it made them so grateful, if not a touch guilty, for how well they have it back home. Once the classroom was built and the teaching sessions passed the teens loaded up for another tourist trip, this time to the famous Machu Picchu. A wonderful guide arranged by Peru’s Challenge took us around the ancient Incan city and explained the history, traditions, construction, process and just about every other detail related to the city, it’s inhabitants and the discovery and re-discovery imaginable. The teens then did plenty of shopping, haggling, eating, soaking (in the local hot springs) and playing in Auquas Calientes, the town closest to Machu Picchu (also known as Machu Picchu Pueblo) before boarding the train back to Cucso where we bade farewell to Selvy and our great cooks and hosts where we stayed while teaching and working in Pumamarca and Miskiuno. This entry is filed under: Earth, South America, Story.